AIR is currently developing a series of infographics featuring pertinent findings from PIAAC. The latest published infographics by AIR and by others are available below. This infographic, prepared by the Education Policy Center at American Institutes for Research, shows the literacy/numeracy skill levels of U.S. incarcerated adults and the impact of participating in job training and educational programs on skill level. This infographic focuses on low-skill workers in the United States and their participation in job-related training. Created using PIAAC 2012/2014 data. These three postcard-size infographics feature facts about the performance of U.S. adults in literacy, numeracy, and PS-TRE in comparison to their international peers. *Updated on 3/10/16 with PIAAC 2012/2014 data. This infographic focuses on how skills and education relate to employment by looking at the relationship between performance on the PIAAC assessment and a variety of employment indicators. *Updated on 4/7/16 with PIAAC 2012/2014 data. This infographic focuses on the skills of U.S young adults (ages 16-24) and uses PIAAC data to provide insight into how their skills compare to other countries in today's global economy. *Updated on 10/25/16 with PIAAC 2012/2014 data. This infographic, prepared by the Education Policy Center at American Institutes for Research, shows the literacy/numeracy skill levels of U.S. adults and how being employed and educated does not guarantee higher level of skills. 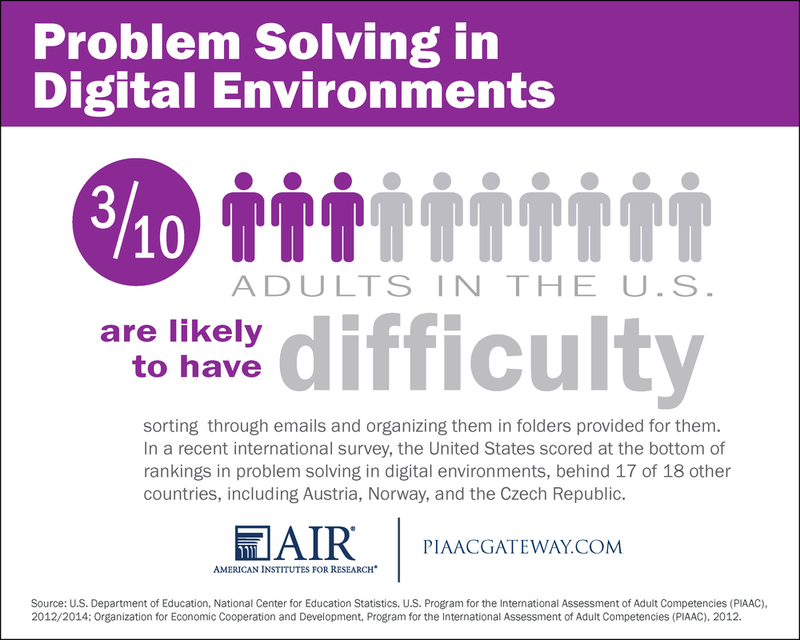 This infographic, prepared by the OECD, focuses on adults' problem solving skills using digital devices. This infographic, prepared by the U.S. Department of Education's Office of Career, Technical, and Adult Education (OCTAE), uses PIAAC 2012/2014 data. This infographic, prepared by Digital Promise, shows that tens of millions of American adults lack the basic skills needed to succeed in a global 21st century economy. This infographic, developed by Change the Equation, reveals sobering new data on millennials' skills and attitudes. What millennials don't know about their tech skills is costing them dearly.